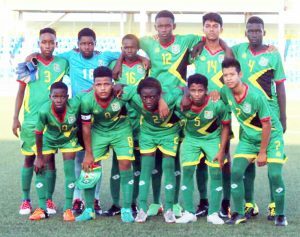 The National U14 Boys’ team registered their first win of the CFU Boys’ U14 Challenge when they defeated Bonaire by a 5 – 1 margin Friday in their third match of the tournament at the Ergilio Hata Stadium, Curacao, at 18:00hrs. CFU Boys Challenge Series – Guyana’s starting lineup against Bonaire. Among the goal scorers were Shoran James who scored a hat-trick complemented by one goal each by Kevon Scott and Rajan Ramdeholl respectively. Ramdeholl, Samuel Garnett, Keishawn Smith, Daniel Lowe and Devon Padmore.